Use this spring cleaning checklist to help you keep your home as tidy as possible. Spring is here, and it’s time to do away with the old and bring in the new. It’s the perfect opportunity for a fresh start. Get your home ready for spring by keeping your home tidy and well maintained. 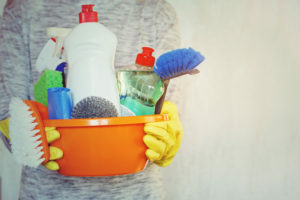 Check out this spring cleaning checklist to help you get started. Give your fridge and pantry the attention that it deserves, and do a little spring cleaning. Toss any expired foods and get rid of any food that you’re not going to eat. Additionally, wipe down shelves to keep them sanitized. Just be sure to dry them thoroughly, especially in the refrigerator so to avoid any mold growth. It’s hard to wash your household fabrics. From sofa upholstery to window treatments to bed linens, it’s important to deep clean these fabrics at least once a year. That way you get rid of any unwanted dirt and dust so that you can best keep your home clean. Rent the necessary equipment and go to town cleaning your home’s fabrics. Winter weather often leaves your windows grimy. Help let in more natural light into your home by having your windows cleaned this spring. Wash them inside and out so that you have pristine windows for the upcoming warm weather. It’s also a good idea to clean your screens and fix any damage to your screens, windows, and doors. From cleaning your dryer to wiping down refrigerator coils to changing your air conditioning filter, it’s important that you clean and inspect your appliances. Taking care of your household appliances helps to extend their lifespan and helps you avoid any home disasters. Keep your home tidy and well maintained for spring with this spring cleaning checklist. Keep your home well protected with the right home insurance. Contact the professionals at Robert J. Los Insurance Agency to find you the right insurance plan. Located in Hamburg, New York, we serve all your personal and commercial insurance needs.